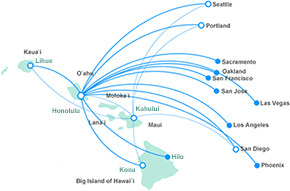 The Honolulu International Airport (HNL) is a large airport located on the Island of Oahu. Although sizable, expect to be mostly outdoors, and to be greeted by tropical flower breezes, when you arrive at HNL. You’ll find the booth for your car rental company is conveniently located beside the Baggage Claim area. With baggage and rental agreement in hand, your shuttle bus awaits just outside the door. It will whisk you up to your rental lot, about 5 to 10 minutes away.